Where was still the customer contract, what are our monthly leasing charges and why we actually have 10 unused mobile phone contracts? The contract management software from Simplessus tells you - even on Saturdays and just before closing time. Do you want more progress in less time? Then you require an efficient software for comprehensive management of your numerous commercial and private contracts. Especially, small enterprises considerably benefit from the methodical introduction of an integrated contract database: They even track painfully in particular small losses of valuable time and tight money. 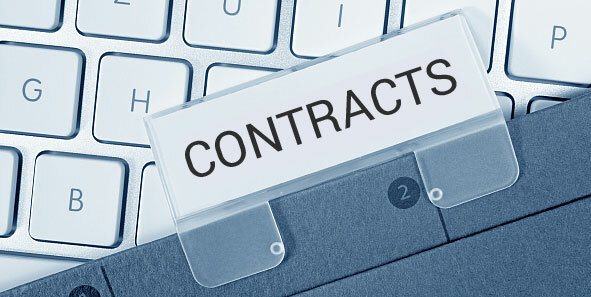 Simplessus contracts comfortably provide timely contract management: This smart contract database manages sensitive dates and critical deadlines as well as all corresponding costs and revenues. 1. File cabinet or expresso-machine? High-quality file cabinets for professional storage of sensitive contracts appear as inconveniently space-consuming. On the contrary, a high-resolution copy of the thickest contract rests completely flat on a small hard drive - as fully electronic contract file. Thus, you can manage any number of contracts in the smallest start-up-office, without sacrificing your reheat-ristretto at the midnight. Once encrypt a paper contract. However, its electronic copy is encoded in your memory stick, which you have forgotten on the public hotspot - and is nevertheless safer than the hardcopy in Fort Knox (or wherever you hide your paper documents). ... the lucrative paper contract with the friendly customer from Dubai? Each critical document appears on your clear screen after a few seconds of comfortable full-text search. ... the overpriced premium-contract - was yesterday. The next 24 months of your smartphone will cost you at Euro 150 in the month less rosy, than huge Euro 3,600. Therefore, you have to be able to purchase more than two economy-versions of Simplessus contracts - and already one of them had timely reminded you via e-mail on the critical deadline. Before these deadline-stricken persons tear the sensitive document into handy pieces, you can rather let both of them work simultaneously and relaxed on their individual electronic copies. 6. Basically, how high are our existing lease obligations? These and countless similar questions from the professional contract controlling usually arise on late Fiday afternoon. The quick reply comes from your Simplessus software, so that you anyhow arrive quickly in your waiting weekend. Thus, contract management can be simple. High-quality cabinets for professional storage of sensitive contracts, for example, cost your good-health. There, on your ergonomic executive chair, you can nicely read a high-resolution electronic copy. Manage your contracts with Simplessus Contracts, even if the little money for the basic version itself is still painful: Then, simply rent this software. Thereby, you do not buy more than you actully require: Practical modules only extend in case of actual need, the function of your small basic version. Of course, Simplessus also speaks CSV and XML and thus makes your spreedsheets happy. Reheat-ristretto, yes! But how ? * What is 5 - 3 ?